Preparing your home and your family for back to school during the summer can reap benefits throughout the entire school year to come. Little by little, as you continue to enjoy this season, setting up routines, stations, and systems now for the impending school year will make for a smoother operation in the fall and beyond. Here are a few areas of focus that can have a significant impact. 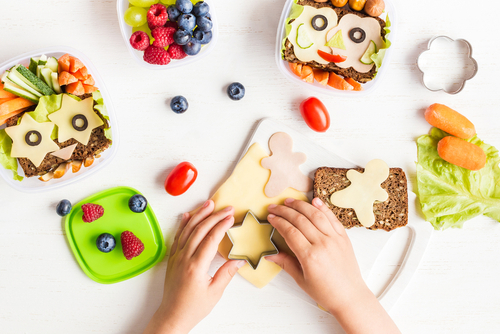 By June, packing lunches and snacks for kids on the go was perhaps a chore you could not wait to forfeit in favor of unscheduled, summer days. This year, relieve the burden of thinking up a menu each day by opting for a lunch packing station. Set up bins in your fridge and cupboard that will house the pre-packed elements of lunches and snacks. Make it a habit, once a week, perhaps the day you do your grocery shopping, to restock the bins with ready-to-grab options. This is a great place for rinsed and cut fruit and veggies, cheeses, nuts, nutrition bars, yogurt cups, hard-boiled eggs, etc. Water bottles and drink boxes can also be added to the station. Want to really kick this system into high gear? Post instructions and encourage the kids to pack their own lunches and snacks. This will give them a sense of responsibility and ease your burden on school day mornings. For inspiration, search “lunch packing station” online. There are lots of creative and organized moms out there sharing great ideas that can make your school year easier. Just as you know you’ll be packing lunch every day, you also know you’ll be processing paperwork all year long. Rather than allowing it to form a pile on the kitchen counter, set up a station that’s easy to maintain to stay on top of forms, reminders, and whatever else comes home in those backpacks. Consider having a separate place for notices and reminders, forms and items to be returned, school work you wish to keep, and artwork. Decide in advance what you won’t keep as a rule and establish the habit of recycling all of that material immediately once school starts. Hanging file folders, bulletin boards, binders with page protectors, or cubbies can all be used to organize incoming papers throughout the year. Another activity that will occur all school year long will be the packing, unpacking, and repacking of backpacks. Set up a specific place for backpacks to go directly after school and a system for unpacking and repacking them. This will work in tandem with the paper system and can be largely be managed by even young children after some patient training. Homework will also be a constant throughout the school year. Providing a designated, distraction-free space for each child can avoid headaches and support a consistent and productive homework routine. Don’t wait for the school year to begin to figure this out. Enjoy establishing lovely spaces for the kids before school gets underway. Once the lazy days of summer wind down, the daily routine tightens up and things need to stay on track to run smoothly. Consider posting routine checklists your children can manage for their morning routines, after-school routines, and bedtime routines. Rather than asking the same questions (“Did you brush your teeth?” “Do you have any homework?” “Do you have your jacket?”) let the kids consult their checklists and enjoy less nagging and more responsibility. Another thing that will ease stress during the school year is if you ease the clutter in your home during the summer. Cleaning out and organizing one drawer, one closet, or one category like the kids’ clothes or the pantry, is something you can probably find time to do in the summertime and your school-year self will thank you. Sleep habits tend to get out of whack in the summer. Gradually encouraging the family to shift from late nights and sleeping in to earlier bedtimes and wake-ups will make the rigors of the school year schedule easier to handle.